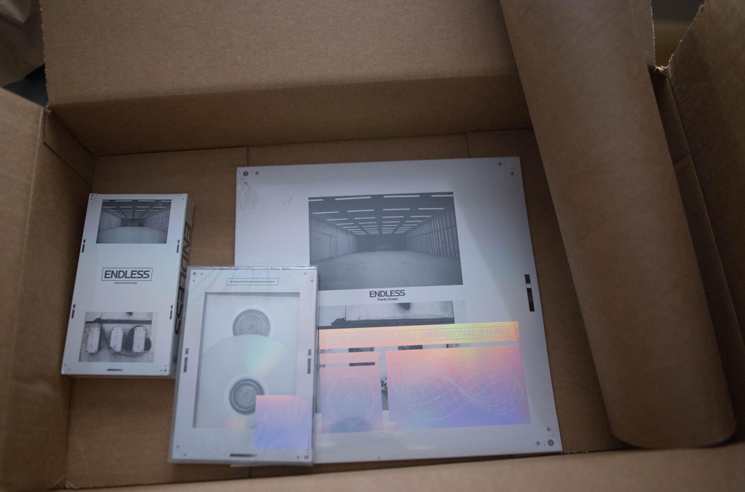 Back in November of last year, Frank Ocean celebrated Cyber Monday by offering up pre-orders for physical editions of his 2016 visual album Endless, available for fans to purchase for only 24 hours. Not unlike the last time Ocean opted to sell physical editions online, fans have been growing impatient with the lack of communication from merch distributors as to the whereabouts of their goods. Nearly five months removed from the initial pre-orders, physical copies on CD and vinyl have now made their way to listeners. Today, Reddit user jxnnt shared a photo (seen above) of the vinyl and CD editions, in addition to a VHS of the album's visual component. Jxnnt then began livestreaming a playthrough of the CD from inside a car. The album now sounds as if it has received a proper mixing and mastering treatment, compared to audio rips from the Endless video that had been circulating online in the absence of an official release. The video also revealed an official tracklisting for the record, which you can find below. Photos of the vinyl edition reveal that album will arrive as two single-sided LPs, with both boasting an etching of Endless' title font on their respective B-sides. The labels and LP sleeves tout the album as "46 minutes of 120 hours in the life of Frank Ocean." It has yet to be revealed when the official audio version of Endless will arrive on digital platforms.